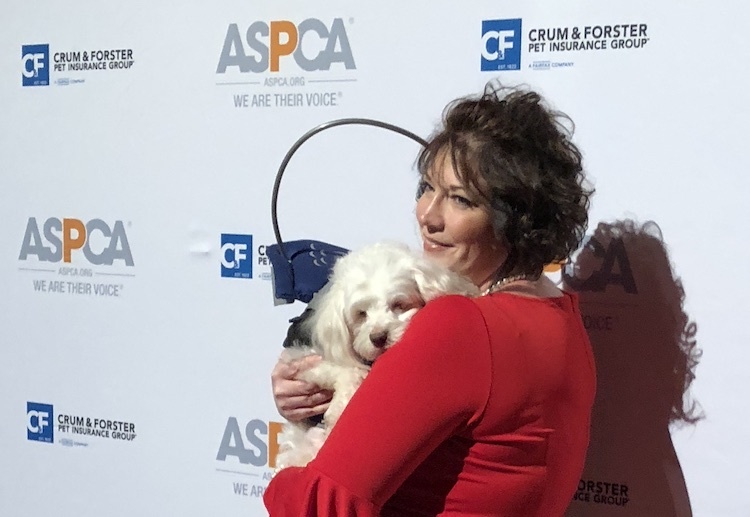 On Thursday, Nov. 15, the American Society for the Prevention of Cruelty to Animals (ASPCA) — the nation’s oldest animal welfare organization — celebrated the 2018 winners of the ASPCA Humane Awards in New York City. These annual awards honor hero animals who assist humans as well as other creatures in astounding ways. They also honor people who have demonstrated unrelenting commitment toward helping at-risk animals. Finalists were selected by an expert ASPCA committee from hundreds of entries received from all over the nation. Winners were then chosen for a number of awards. Born blind and with a spine defect that immobilized his back legs, Noah is a 3-year-old cockapoo from Mineral Point, Wisconsin, who uses a custom wheelchair to move around. With his mom, Lisa Edge — a teacher — Noah regularly visits children in schools to sensitize them on issues pertaining to bullying, not judging people based on their physical appearance or abilities, and differentiating between empathy and sympathy. With the help of a specialized curriculum designed by Edge, Noah teaches the kids that even though people and animals may have different appearances, abilities or disabilities, they all share the same world. Edge says she gets thankful messages almost daily from children who have suffered from bullying and have found comfort in Noah. This special dog doesn’t like taking days off — when he’s not in the classroom, you are likely to find him sharing his love with senior citizens at a local nursing home. 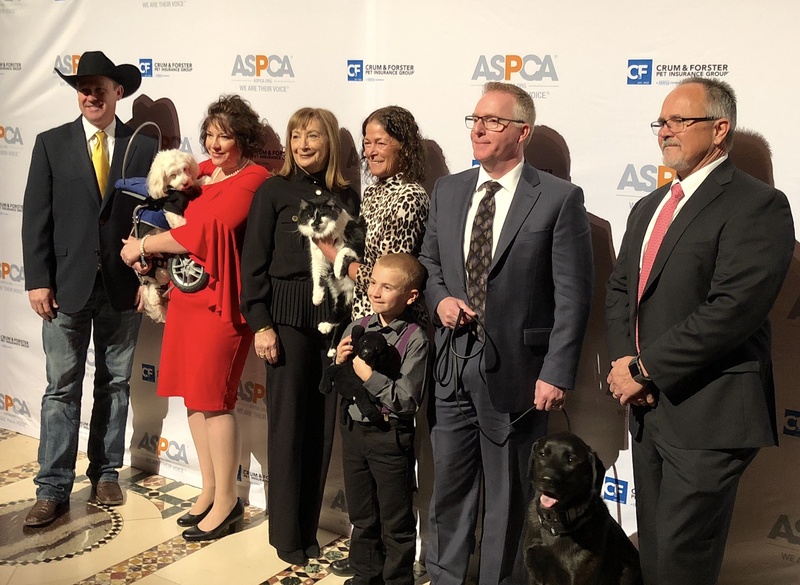 The determined pup is the 2018 ASPCA Dog of the Year for not only overcoming his disabilities, but also teaching kids invaluable lessons about respect and tolerance. Please see below for a transcript of Lisa Edge’s emotional, heartwarming speech during the awards luncheon. And you can follow Noah on Facebook here. 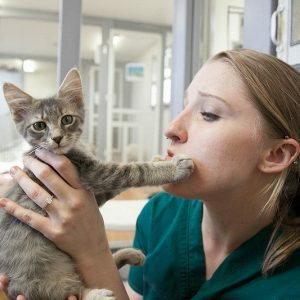 The recipient of this award is a cat named D-O-G (pronounced dee-OH-gee) from St. Louis. 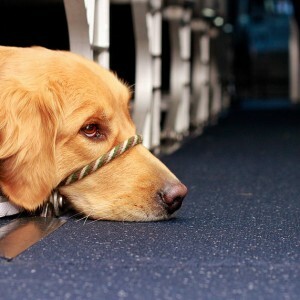 D-O-G’s job as a service cat is to provide unique behavioral training for service dogs at Duo, Inc. who are learning either how to assist people with hearing or mobility disabilities, or how to provide emotional support to people who need it. D-O-G’s presence around the dogs helps them become comfortable around other animals — especially cats — so the dogs aren’t distracted during work. The once-homeless kitty was named cat of the year for his unwavering dedication and fearlessness in helping canines become effective service dogs. Roman McConn, 7, from Evans, Georgia, has a passion for and commitment toward vulnerable animals that is well beyond his years. For his 4th birthday, Roman asked that donations be made to an animal rescue rather than go toward gifts for him. That’s just one of the boy’s numerous acts of compassion toward helpless animals. Today, when not at school, he spends his time making viral videos with homeless canines to help them get a home. He is also actively involved in his mom’s relocation network community dubbed Project Freedom Ride, which helps send homeless pets to other locations where they have a better chance of getting adopted. 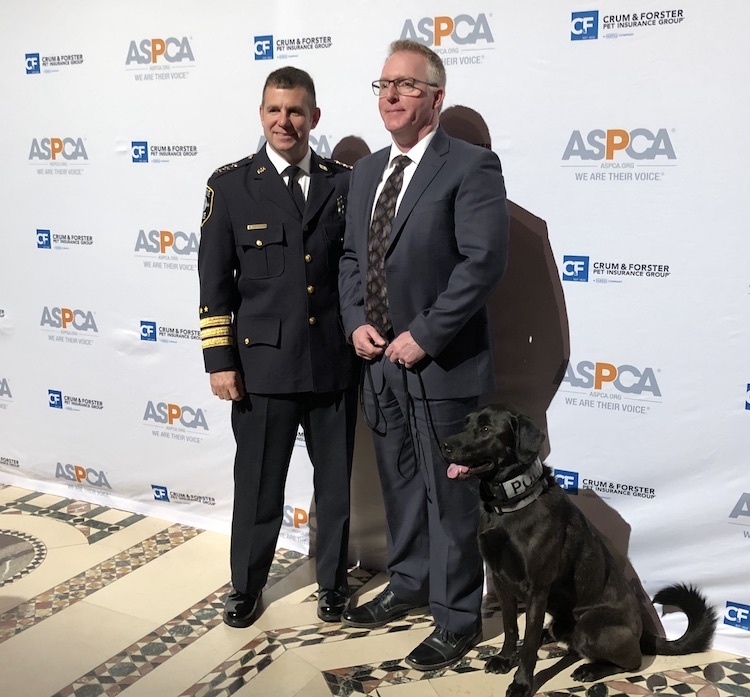 2018 ASPCA Public Service Award winner Bear, held by handler Detective Ian Polhemus. Bear is Labrador-mix police dog from Seattle. 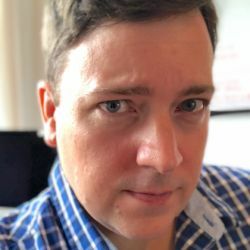 Formerly homeless, he found his calling in an innovative Indiana program that trains animals to sense electronic storage devices. He is only the third police dog worldwide to receive that kind of high-level training. These skills are invaluable toward collecting evidence pertaining to child exploitation cases and the subsequent prosecution of the offenders. Here’s an interesting fact: Bear helped take down “Subway Jared.” This electronics-sniffing dog found digital devices that search teams had missed during a raid on Jared Fogle’s home in July 2015. The ambitious police dog has lended his expert services in other high-profile cases as well. Over the past 3 years, Bear has been involved in over 125 cases, recovering dozens of pieces of critical evidence. Oh, and there’s more: Bear is also a source of emotional support to both police officers and witnesses. For all his contributions to the police force, Bear is especially deserving of his 2018 ASPCA Public Service Award. Animal Care Centers of NYC (ACC) is the premier animal welfare association for New York City. ACC works to find homes for thousands of abandoned pets by adopting them directly to the public via partnerships with more than 300 regional animal welfare associations, including the ASPCA. The organization’s efforts to end animal homelessness have had a monumental impact on NYC’s animal welfare ecosystem. In 2017, the ACC achieved a laudable 93% live-release rate, with adoption rates climbing by 12% since 2014. Since the inception of the ACC’s “surrender prevention” program a few years ago, the organization has been able to help more than 4,000 pets find forever homes. For this and more, the ACC was awarded the ASPCA Henry Bergh Award — named after the legendary animal welfare hero who established the ASPCA in 1866. The Dumb Friends League Harmony Equine Center was ASPCA’s No. 1 choice for the Equine Welfare Award. This equine center serves as a rehabilitation facility for neglected and abused horses, mules, donkeys and ponies from rescue groups across the Midwest and southwestern United States. After rehabilitating these animals, the center looks for responsible caretakers with the help of a thorough vetting process. Since 2012, the group has rescued more than 1,500 horses. Approximately 4 years ago, this dog was born. But this dog wasn’t born in a warm house with comfortable blankets. He wasn’t expected to live, no one was excited about his birth, there was no bed or no box to be born in. There was no love. There was greedy backyard breeders that gave him no attention and no food. Noah and his many siblings were born into abuse and neglect. Starvation claimed most of these babies. Somehow, and beyond anybody’s comprehension, Noah survived. Survival was not easy for this pup. He’s most unusual looking, and obviously he’s unusual looking because he doesn’t have eyes, and of course, his back legs are flippers. His legs are so deformed that there’s no surgery that could correct them so that he could have normal function. They’re about half the size of what normal back legs should be. As a result, he is a hit with the kids when we go to schools because when he starts to flip around with the flippers like you saw, it gets the kids really excited — and, of course, the excitement just makes him show off that much more. So, it works for Noah. His donated wheelchair by, Judy Walter and Mango on a Mission, keeps his knees healthy so he can keep up with the kids at school. As you can see, his legs are permanently fused, and without that wheelchair he would clump. They’re fused, so sometimes if he works a little too hard at a school, sometimes he gets a little water on him, so we try to keep him in that wheelchair and protect them. With these messages, he has been lovingly dubbed “the anti-bullying dog” all across the world. Through these messages, Noah encourages kindness, acceptance, tolerance, no matter what one looks like, believes in or stands up for. We all these same needs: to be accepted, one and all. Noah embodies everything the ASPCA stands for. He is a great example of the kinds of horrible situations animals find themselves in every day, like abuse, neglect, backyard breeding and those awful puppy mills. Since 1866, the ASPCA’s mission has been to provide effective means for the prevention of cruelty to animals throughout the United States. The ASPCA saves the lives of thousands of dogs just like Noah, every single year. I find it ironic that APSCA’s motto is, “We are their voice,” because this is what Noah does in his anti-bullying tours. Noah has a unique way of letting kids know that those who are bullied are loved and that they are accepted no matter what they look like, dress like, or believe in. And, under no uncertain circumstances is bullying ever OK, by children or adults. Thank you, ASPCA, for giving Noah the platform to be heard. Today Noah carries a torch for the bullied kids, the depressed and for the lonely, and those who have taken their lives because of constant bullying and teasing. We also carry the torch for those animals left behind, forgotten, unloved, and unwanted because of greed. Or because they were born with missing pieces or parts. “From humble beginnings come great things.” I don’t know who said this, but I’m pretty sure they were talking about your 2018 Dog of the Year, Noah. And the ASPCA, we will do you proud!